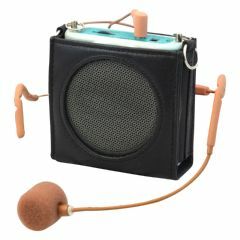 AllegroMedical.com presents the ChatterVOX Amplio Voice Amplifier. This compact voice magnifier is the smallest most discreet model we carry. It enhances weak voices allowing the speaker to be easily included in everyday conversations. The lightweight speaker is designed primarily to be worn around the neck though it can be clipped on a belt or placed on a table. When the speaker is worn around the neck the sound of the voice is close to the visual source this encourages lip reading as well resulting in improved communication. Dimensions: 3" x 3" x 1.378"